As India braces for a new world order, congruence on terrorism, current disquiet on immigration, short-term visa tops the wish list. Archis Mohan, Shivani Shinde Nadhe, Aneesh Phadnis and Ayan Pramanik report. India's foreign policy minders in South Block, as also those who manage the ruling Bharatiya Janata Party's Diaspora outreach, believe Donald Trump's triumph offers opportunities for New Delhi to reach out to the new administration on points of congruence between Prime Minister Narendra Modi and Trump, particularly on the issue of terrorism that could help India further isolate Pakistan. Prime Minister Modi was one of the first world leaders to congratulate Trump. Modi said he looked forward to working together to enhance ties. During his election campaign, the US President-elect had good things to say about the Indian economy and the Indian PM's leadership. The election time bonhomie between Trump and Hindu groups among the Indian Diaspora in the US aside, points of concerns in India about the policies of the putative Trump administration are quite a few. South Block, as well as Indian industry, has apprehensions on several counts. Trump's positions on climate change, outsourcing and immigration being the foremost. During his campaign, the US president-elect had also questioned multilateral trade agreements, particularly the Trans-Pacific Partnership between the US and 11 other Pacific Rim countries. Amid fears that Trump might restructure the H1B visa structure that could make it difficult for US firms to hire Indians IT professionals and also freeze Green Cards, stock prices of IT bellwethers such as Tata Consultancy Services, Infosys, Wipro, HCL Technologies, Tech Mahindra were down 4.93 per cent, 2.74 per cent, 1.27 per cent, 2.76 per cent, and 4 per cent, respectively, as the market closed. There were also some looking at better prospects, especially in the pharmaceutical and real estate sectors. Trump's proposal to lift entry barriers for drugmakers that offer safe, reliable and cheaper products bodes well for Indian companies, industry experts claimed. On Trump's views on outsourcing -- he had once even made fun of accents of Indian call centre workers -- experts dismissed it as election time rhetoric, pointing out how US President Barack Obama had also talked about such issues. On the diplomatic front, that Trump is largely dismissive of climate change is worrisome for India. In recent years, the Modi-Obama meetings had led India to collaborate with the US in the sector to get access to technology. The only unanimous view among government officials and the BJP's foreign policy watchers is this -- a Trump victory offers India many more opportunities than what might have been in store if Hillary Clinton had won. If Clinton were to win, the Indian foreign policy establishment even feared a return of hyphenation in the way Washington, DC views India-Pakistan relations. The Overseas Friends of BJP, the Diaspora arm of the ruling party in New Delhi, was under pressure from both Democrats and Republicans, given Modi's popularity among the Diaspora, to indicate its support to their candidate. "Our Diaspora has both Republicans and Democrats. There was no question of indicating our preference. This is an internal electoral process of the US. Our members and Diaspora communities made their own choices based on local conditions," OFBJP chief Dr Vijai Chauthaiwale said. Foreign policy minders are alert to the opportunities that a Trump presidency offers India. The new Trump administration, to take shape in the days to come, is being keenly watched. Trump supporters like Shalabh Kumar, president of the Republican Hindu Coalition, and other non-resident Indians among the Republicans, could become points of contact with the Trump administration. The Indians also have good contacts in the Heritage Foundation, a US-based conservative think-tank that has supported Trump's presidential campaign and is all set to play an important role during his presidency. Trump's views on South Asia are not known. He has only been to India once, a visit to Mumbai where two buildings with his name were coming up. But in early 2016, Trump said India had become a 'top place' for investment after Modi's election. He also said that Pakistan was 'the most dangerous country in the world today' and that India was the only country that could check Pakistan. Trump has also identified China as a potential rival of the US, mostly in the context of trade. It is good news for New Delhi that he has come across friendlier towards Vladimir Putin-led Russia. 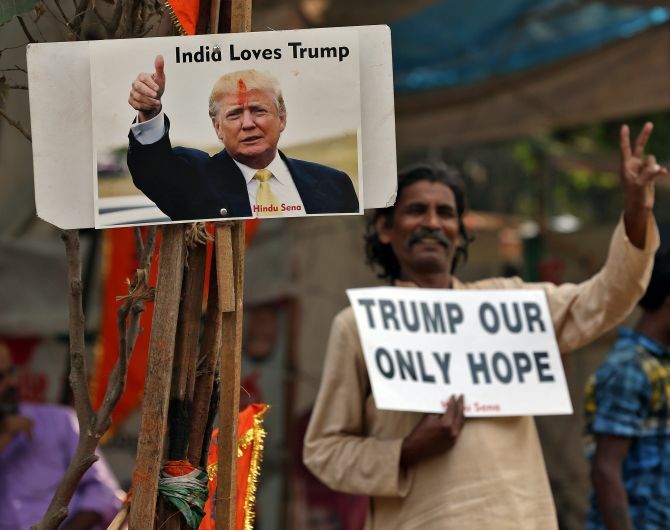 But New Delhi is unlikely to overinvest in Trump given the overarching assessment here that his tenure since his election has caused divisions in American society, is set to be fractious and unlikely to be more than one term.